WASHINGTON (AP) — A few months after finishing college, Angela Achen sat in a hospital waiting room and took stock of her assets: A degree in art history, a knack for women's studies and almost no marketable job skills. She asked her father, who doctors told her was in his final hours, whether he had any last wishes. He paused, thinking deeply, then smiled and said three words: "Be a lawyer." "I think he said it because he knew it was something that would make me happy," Achen said. So Achen enrolled at the University of Minnesota Law School, encouraged by the school's statistics on graduates' salaries and hungry for a career in international business. But as graduation neared, she sought job advice from her professors and from practicing lawyers. Extend your studies another few years, they urged her, or volunteer for a nonprofit. Anything but look for a job. "The advice I got from all of them was don't even bother applying to law firms right now, because you're just wasting your time," said Achen, now 30. "They're not hiring." New data released by the American Bar Association in June revealed that barely half of those who graduated in law school in 2011 found fulltime jobs as lawyers within nine months of graduation. A separate survey from the National Association for Law Placement in June found the overall employment rate last year was the lowest in 16 years. Although the crisis has been brewing for about a decade, marked by a sudden jump in demand for law school seats, the warning signs until recently had largely been brushed aside, dismissed as another unfortunate symptom of the so-called "jobless recovery" that has left numerous industries in shambles. The most obvious solution — a reboot of the system to match supply with demand — was off the table. Now school officials, industry leaders and even U.S. senators are sounding the alarm, and considering drastic steps that under other circumstances might be deemed draconian. "It is not a blip. It is not temporary. It is a permanent, structural shift," said Frank Wu, the dean of the University of California's Hastings law school in San Francisco, which is cutting its incoming class by 20 percent. Last year, 425 students made up the freshman class at Hastings. This year, the target is 330 students. Out of a payroll of 275, the school eliminated 21 positions through layoffs, buyouts and attrition, and reduced another 10 workers to part time. No faculty were let go, said Wu. "This is a wrenching, hard decision to make. We're sacrificing to reduce our class size," he said. Some insist the government needs to stop issuing loans to every student who is admitted to law school. But such proposals inevitably lead to questions about the wisdom of letting the government pick winners and losers — and whether denying loans would give wealthier students an unfair advantage. Others argue the ABA needs to relax its standards for law school accreditation, which require rigid faculty ratios, expansive libraries and other features that drive up the cost of a legal education. Fewer regulations would make room, they say, for lower-cost schools whose graduates could work for reduced rates and still afford to pay off their debt, which averaged almost $125,000 last year for graduates of private law schools. Barry Currier, the ABA's interim consultant on legal education, rejected the notion that the standards are too high, calling them the basis for what graduates need to successfully enter the profession. He said there's room within the standards for schools to offer different price points. By far the loudest call has been for increased transparency, so that students can accurately assess whether it's smart to drop such a large sum on a law degree. The need for sunshine, proponents argue, has multiplied over the past decade as the statistics students rely on have deviated further and further from reality. Around the turn of the millennium, the competition for law school seats spiked, just as tuition costs were also on the rise. 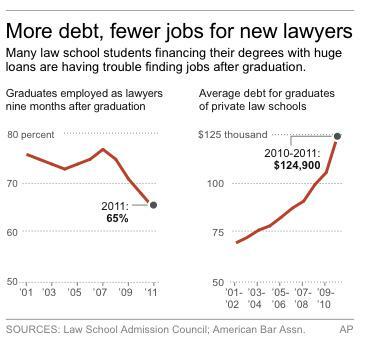 But demand for lawyers didn't keep up with supply, a gap that only widened when the recession hit in 2007. With fewer Americans able to shell out hundreds of dollars an hour for legal help, many turned to low-cost options, such as the Internet and legal clinics, and away from the private firms where graduates seek jobs. The bleak reality was a rude awakening for students who had relied on school statistics to weigh the risks and benefits of going to law school. Job placement figures didn't differentiate between those who had scored jobs as lawyers and those who were working at Starbucks. And salary figures were averaged, meaning they didn't reflect what on a chart would look like a double-humped camel: A lot of people earning next to nothing, some earning six figures and almost nobody in the middle. Students caught on and law school applications started decreasing, a shift that amplified the problem rather than solving it. Some schools, anxious that accepting students with lower scores and grades would undercut their rankings, started to entice top applicants with generous scholarships, which in turn drove up tuition costs for everyone else. Other schools took a more novel, if not distorted, approach: paying their own graduates to volunteer for a year at nonprofits, government agencies and public-interest firms, thereby inflating their own job-placement rates. The University of Virginia, a top-ranked law school, hired 17 percent of its 377 graduates in 2011. The school has a 95 percent rate of fulltime employment in positions requiring bar admission. Subtract those graduates whose salaries are being paid by their alma mater, and it drops to 78 percent. "It's a Ponzi scheme, in almost a literal sense," said Paul Campos, who teaches at the University of Colorado Law School in Boulder. "You're taking money from current students and paying it to unemployed graduates." The furor over misleading statistics prompted a number of class-action lawsuits by graduates against their alma maters. It also spurred action by two senators: Republican Chuck Grassley of Iowa and Democrat Barbara Boxer of California, who both pressured the ABA last year to provide better information about jobs, loan default rates and salaries. "It's sort of a truth-in-advertising approach," Grassley told The Associated Press. "Not to make a decision that some law needs to be changed, but transparency, and let the consumer be fully acquainted with what the situation is." The ABA relented on most counts, and for the first time this year broke down the types of jobs that graduates are receiving. But the ABA declined to make school-specific salary information available, citing the difficulty in obtaining reliable data. Schools can report their own figures on their websites — and many do — but there's little accountability. "It's still kind of the wild, wild West when it comes to salaries," said Kyle McEntree of the group Law School Transparency. With her freshly printed diploma in hand and no job prospects in sight, Achen hopped a flight last summer from Minnesota to Florida, where she moved back into her childhood home in Pensacola. From that same home she launched a one-woman law firm, where she handles any case that comes across her desk: wills, landlord-tenant disputes and alimony. She averages about $1,000 per month. "There are many days when I eat oatmeal for breakfast, lunch and dinner," Achen said. "But oatmeal is cheap and it's healthy, so I'll do it."